The seedling of the mighty oak has had an unusual start in life. Raised using techniques pioneered in fertility labs, it is the product of new efforts to preserve the seeds of wild plants. The world is losing plants at an unprecedented rate, with about one in five thought to be at risk of extinction. 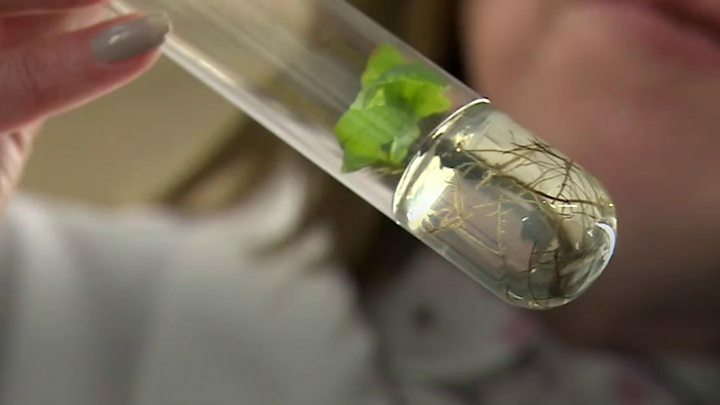 "It's an insurance policy against extinction in the wild," says Dr John Dickie of Kew's Millennium Seed Bank at Wakehurst in West Sussex. "In situ conservation, in a reserve, is always the best, because then evolution can happen all the time. This is a very cost-effective back-up in case that system fails." As a back-up in the event of doomsday scenarios such as war, seeds of crops and wild plants are being stored in bomb-proof, flood-proof, radiation-proof vaults. The goal is to store at least 75% of threatened plant species by 2020. But new predictions suggest this is unlikely to be achieved, because many seeds cannot be stored using conventional means. According to models published in the journal Nature Plants, 36% of critically endangered plant species, 33% of all trees and about 10% of medicinal plants fall into this category. "Not all the plant species can be banked in the way of dried seeds in the freezer like we do in the seed bank," says Daniel Ballesteros, who works on cryopreservation at the Millennium Seed Bank. "For example, we have the oaks and the chestnut that have desiccation-sensitive seeds and if we dry them, we kill them." In this way, trees such as the oak can be stored for the future. But new investment will be needed to perfect the techniques and to build cryopreservation facilities alongside conventional seed banks. The Millennium Seed Bank already houses almost 40,000 wild plant species, which are stored, dried and kept at -20C in the vaults. Others around the world focus on crops, such as rice and their wild relatives. In a laboratory above the vaults, seeds collections manager, Janet Terry, is sorting through a shipment of seeds from Tanzania, which will be added to the collections. They could have value as foods, fuels or medicines. "We don't know what's in them," she says. "But the really important thing is that with our changing climate - we collect and preserve these things before they've gone - and then we can use them for any purpose we can find for them." Banked seeds are already proving useful. In a meadow overlooking the medieval wooded landscape of the High Weald, I meet conservation manager Ian Parkinson. Meadows are now a rare and threatened habitat in the UK. Seeds of local plants kept at the seed bank are being used to restore the natural biodiversity of the landscape. He says the seed bank is like a bank account in that you can make deposits and withdrawals. "So some seeds are stored there for the future," he says. "But, really a seed is better in the ground growing and that's what we like to do here."